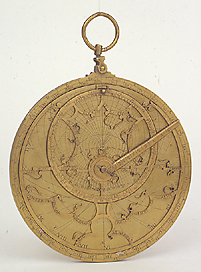 This astrolabe is made up of the mater which contains five plates engraved on both front and back for different latitudes. The back bears the zodiacal calendar and a graduated pointer. The use of the instrument was probably predominantly astronomical.